In today’s increasingly wireless world, many forget the massive physical infrastructure used to connect everyone to the Internet. Satellites are used for broadcasting, but most of the world’s information is carried over tiny fiber-optic cables buried in the sea bed that span entire oceans. 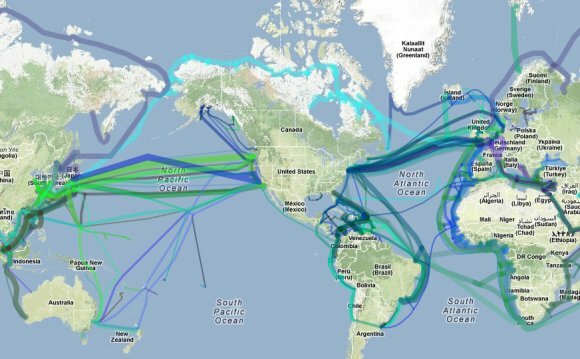 TeleGeography, a telecommunications market research firm with offices in San Diego, Washington, D.C., the U.K. and Singapore, catalogued all 263 of these cables (and 22 more that are coming soon) and visualized them on its annual Submarine Cable Map. Like an international version of New York City’s subway map, the Submarine Cable Map provides a unique look at how the world is connected in the information age. The advantage to using cables to deliver information is that it is much less expensive than using satellites, so much larger amounts of information can be carried. Although satellites can reach remote parts of the world and projects like the Outernet and Google’s Project Loon aim to use airborne devices to beam wireless Internet to mobile devices, countries around the world are investing more in building new fiber-optic cables. The developed world is also continually building new cables to back up the existing ones, which constantly face the dangers both natural (earthquakes, landslides, hurricanes, etc.) and manmade (dropped anchors). The 2011 tsunami destroyed many of Japan’s cables, but the country was able to stay online thanks to a healthy network of backups. When large, international telecommunications companies like AT&T and Level 3 began laying cables in the early 2000s, they were very expensive. Jon Hjembo, a senior analyst at TeleGeography, explained to the International Business Times that one of the early cables that crossed entire Atlantic ocean cost more than $2 billion, though most today are in hundreds-of-millions range. "Length adds to the cost, and complication of the system, " Hjembo said. "Point-to-point is more cost effective than [lines] that branch to multiple landing stations in different countries." Some of the short, regional cables - like ones running between the countries of Georgia and Russia, Kuwait and Iran, or Syria and Cyprus - can be $10 million or less, though Hjembo noted that when one looks at cost-per-kilometer, these cables can actually be more expensive than the longer ones. A recent cable under the Mediterranean cost about $90, 000 per kilometer, while a new $560 million trans-pacific cable connecting the U.S. and Asia only ran about $28, 000 per kilometer.